Tensions between Russia and the West have increased considerably since the 2013 Maidan Protests that ultimately led to the toppling of the Ukrainian government. Russia was particularly disturbed by the Ukrainian revolution, seeing the protests as a Western plot to gain influence over a core country in the Russian sphere of influence. Indeed, Russian and Ukrainian history are so intertwined that many Russians consider Ukraine as part of Russia itself. In the West, however, the protests were seen very differently — as a grassroots uprising against a corrupt government operated from Moscow. Given this disparity in perceptions, Russia’s actions in the wake of the Ukrainian revolution have puzzled and alarmed Western observers. Since the Ukrainian revolution, Russia has conducted a number of aggressive military actions in Europe. In 2014, it annexed the Crimean peninsula and fomented an uprising through pro-Moscow elements in eastern Ukraine. Additionally, Russian submarines have become more active around Western waters and Russian fighter jets have, on several occasions, made provocative flybys against NATO aircraft and warships. In response, the US has increased its military presence in Europe, moving F-22 jet fighters to the region and pledging further military support to the countries of Eastern Europe. 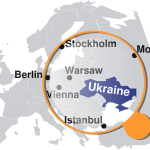 The Ukrainian Revolution’s Fallout: US / Russia Nuclear Arsenals an Incentive to Minimize Rising Tensions? Although the situation in Ukraine has cooled, corruption continues to plague the government, making long-term prosperity and stability difficult to achieve. Unfortunately, there are few signs that tensions between Russia and the West will abate any time soon. Many Western observers believe that Vladimir Putin, Russia’s President, views confrontation with the West as necessary, both to demonstrate Russia’s continued relevance and to boost his government’s image at home. Even though tensions between Russia and the West are likely to continue, neither bloc will have much to gain from escalation. Both the US and Russia nuclear arsenals are significant, providing strong incentive for both parties to avoid open conflict. This US / Russia nuclear issue is enough incentive alone, but Russia and the West also need to work together on a host of global issues, such as the Syrian conflict, US and Russia nuclear arms, and terrorism. As a result, the global security firm, IMG Group, believes that tensions between Russia and the West will remain strained, but are unlikely to significantly escalate in the near term.